This four day scenic touring classic starts in Vancouver and takes two days to ride east along Columbia River, crosses the Columbia at Biggs Junction, and takes two more days to return to Vancouver along the Oregon side of the Columbia. For many years, Jim O’Horo, a member of both the Vancouver Bike Club and The Portland Wheelmen Touring Club, and an activist in the cycling community, organized and led this ride. Jim passed away a few years ago and the ride was renamed in his honor. This is a moderately paced, 4-day, self-supported bike camping tour (a “loaded tour”) of the spectacular Columbia River Gorge National Scenic Area, covering 51-65 miles per day, through breathtaking but sometimes challenging terrain. 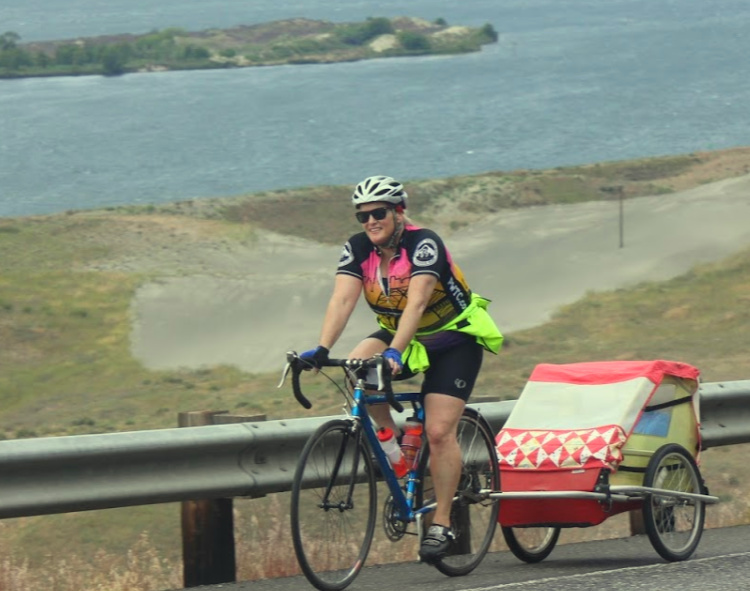 The tour leaves Vancouver, WA on Friday May 24, traveling east in Washington, crossing the Columbia River at Hwy 97, and returning to Vancouver on Monday May 27, by riding west in Oregon. The tour allows plenty of time for sightseeing at the many cultural, historical, and scenic points of interests. We have reserved camping spaces for 50 riders. Registration will remain open until we reach that number or until May 22. Mail-in registrations must be received by that date. We are trying something new this year. Maps and cue sheets will be emailed to participants as in previous years, but we plan to have downloadable maps and cue sheets for your GPS or smart phones. Links for the downloads will be provided to registered riders. If you want to try bicycle camping, here’s an inexpensive opportunity to experience some of the best scenery in North America. This tour has run for 20 years to rave reviews. Although this is a good match for both first-time and experienced “tourers,” riders need to be physically prepared for the daily mileage and sustained hill climbing (mileages shown below are close, but individual bike computers may vary slightly. Side trips and shortcuts may also affect the total mileage. Day 1. (49 miles) Vancouver to Home Valley Park. We’ll head out via local roads through Camas and Washougal, along forested Washougal River Road, then pass Beacon Rock, Columbia River Gorge Interpretive Center, Bonneville Dam, and the town of Stevenson, taking in the views of scenic Gorge peaks before camping at a small county park just past the turnoff to Carson. Supplies and restaurants are available in Stevenson. Day 2. (62 miles) Home Valley to Deschutes River State Park. Continue past stunning cliffs and peaks, through a series of tunnels and passing Catherine Creek scenic area, the small towns of Bingen and Lyle, and the pictographs at Horsethief Lake State Park. Then climb through open hills with expansive Gorge views to Maryhill Winery and Maryhill Museum of Art (extensive collection of Rodin sculptures) before crossing the Columbia into Oregon and heading to our campsite on the Deschutes River. Some food (mostly fast food) available in Biggs. Day 3. (50-52 miles) Deschutes State Park to Viento State Park. Warm up with a short ride to The Dalles for a hearty breakfast. Most riders will eat at Cousins Restaurant. Then we’ll continue on the Historic Columbia River Highway for the steady climb to the Rowena Crest viewpoint, continuing on a car-free multi-use path through the spectacular Mosier tunnels, then via Hood River to our forested campsite. Supplies, restaurants, and bike shops are available in Hood River. Day 4. (58 miles) Back to Vancouver, mostly along the HCRH including recently added car-free paved trail sections, through Cascade Locks, past seven waterfalls including Multnomah Falls, with a climb to yet another spectacular viewpoint at Crown Point before descending to ride along the Columbia and back to our starting point. ODOT is reporting that all roads and trails through the Gorge will be open by Memorial Day. Stay tuned. This tour was designed so that first-time bicycle campers can try loaded touring at minimal expense. Participants pay $20 with registration that covers the cost of our reserved group campsites on all three nights. NO SAG is provided for this tour. The tour is self-supported; you must be able to ride the indicated distances with your gear, and be able to do basic repairs yourself including fixing a flat and replacing a dropped chain. A few basic tools should be part of your gear. You need your own emergency contact and backup plan in case of severe mechanical failure or injury. Make sure you and your bike are in proper condition for the ride. However, if you’re inexperienced at self-supported loaded touring, you need not worry. In fact, this is a terrific opportunity to learn from more experienced touring cyclists, including some who have ridden cross country. Several riders with mechanical skills will be on the tour, and may be able to help if you get into difficulty. Riders may choose to find a partner or two to share gear and lighten each other’s load. Yes, there are sustained hills, but no long grade exceeds 7%, and at the expense of missing some of the scenery, three of these can be bypassed. The route has been designed to take advantage of quiet roads and multi-use paths at every opportunity, but there are still stretches where it is necessary to ride on the shoulder of a highway or freeway. Although designed for camping, the route includes enough motels and B&Bs to provide other lodging options in the case of severe weather. Each day provides multiple opportunities to stop at cafes, restaurants and grocery stores (although there are no restaurants at the campsites); some riders choose to carry most of their food, while others prefer to minimize their load and eat out as much as possible. Starting in the spring, registered riders will receive email newsletters containing suggested gear lists and other information including the cue sheet and detailed itinerary. There’s so much to see and do on this route you can’t possibly do it all, so we’ll supply a laundry list of possibilities including many historic sites, side trips to parks, hot springs, and several museums. For more information, read our FAQs and check out some Columbia Gorge highlights. In addition, the downloadable ODOT Columbia Gorge Bike Map provides a useful overview of much of the area we’ll cover. The ride leaves Friday, May 24, 2019 between 8:00 am and 9:00 am in small group staggered starts, from Larson’s Bakery, 13411 SE Mill Plain Blvd., Vancouver, Washington. Riders must sign in at the start. OR print, complete and sign a registration form and mail with a check payable to PWTC. A non-refundable shared camping cost of $20 per person is to be submitted along with the completed registration form. There are no discounts for riders who elect to stay at motels, other campgrounds, or alternative modes lodging. Registration is due by May 22. For additional information or questions, email or call ride leader, Dave McQuery of the Portland Wheelmen Touring Club, dmcq1943@comcast.net or Kyle McMurray at ultrakyly@yahoo.com.